EntropiaPlanets community ads - you can advertise here too. Find more in the General Entropia Universe Discussion forum section! The original price MindArk is selling 1 deed for is 1000 PED (=100 USD). The TT value of 1 deed is 0.??? ?1 PEC. In total MindArk is offering 60,000 deeds equaling a total sale value of 6,000,000 USD. The deeds can only be bought in-game by Entropia Universe avatars. Similar citizenship programs will be available for each planet partner reaching a specific number of registered accounts. Calypso Land Deeds are not lootable in PVP Zones. Calypso Land Deeds are Land deeds (just like Arkadia Underground Deeds or Battle Arena Deeds) and similar to shares offered for sale to players of Entropia Universe. Announcement and discussion thread: Entropia Universe takes Virtual World Citizenship to a whole new level! Revenues for Calypso Land Deeds are supposed to be paid out every Monday shortly afer 00:00 EUT. Deeds owners will receive the revenues on their account in the PED Flow Center. 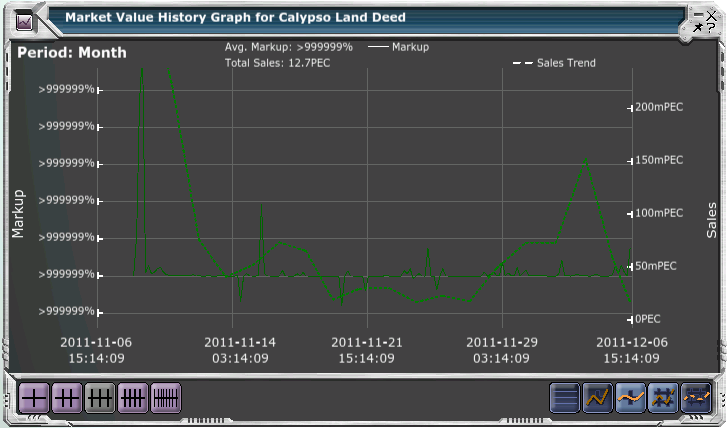 For additional charts please refer to the main page Calypso Land Deeds Revenues. RSSRSS Feed containing the latest revenue. EP Wiki can generate a multitude of variations of RSS items, if you need something specific please let us know. 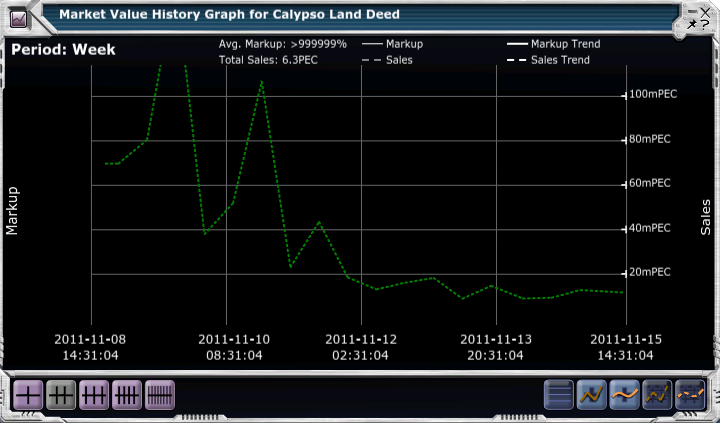 How to get Calypso Land Deeds Markup from Virtual Tycoon? This chart displays the weekly revenue in % based on the original offer of 1000 PED per deed. This chart displays the weekly revenue in % based on the approximate market price per deed in that week. This chart displays the approximate market price of 1 deed in PED. Planet Calypso introduces a groundbreaking Citizenship System that includes Land Lot Deeds with an expected annual return on investment of up to 30%. Gothenburg, Sweden, November 8th, 2011 – MindArk, developer of Entropia Universe, announced today that it will introduce a groundbreaking new Citizenship System. This system will provide planet-wide revenue sharing to participants, as well as a forthcoming political system that will allow users to influence the future development of the planet. The new system will allow participants of Entropia Universe to acquire a Land Lot deed. This deed grants holders citizenship on Planet Calypso, along with political voting rights. Citizens of Planet Calypso will receive a share in the planet partner Gross Revenue. Based on Planet Calypso’s performance over the last twelve months, the potential ROI (Return of Investment) of such shares is expected to be between 27% - 30% per year. The new Citizenship System will showcase the economics of a successful Planet Partner on the Entropia Universe platform. Planet Calypso is a profitable Virtual world. It is the oldest of the planets in Entropia Universe, has over 1 million registered users and over $ 400,000,000 USD per year in user-to-user transactions. Each Land Lot deed entitles the holder to a share of the 50% planet partner Gross Revenue generated by Planet Calypso. Payouts of revenue share dividends to deed holders will be made once per week, as opposed to once per year or once per month for many other investments!" The success and profitability of the planet will determine the revenue received as a land lot deed holder. If Calypso becomes more popular, the ROI will be higher; similarly, if the popularity of Calypso decreases, the ROI would also decrease. First revenue payouts are planned for the beginning of December 2011. Once every six months, audited figures will be presented on MindArk’s homepage so that deed holders can verify their revenue share payouts. Current land area deed holders on Calypso will be entitled to one free land lot deed. This does not include deeds for claim battle areas, houses, apartments, shops or sub-divided areas, only Outback Land Areas (OLAs). Treasure Island, FOMA, Crystal Palace and Medusa’s Head will receive one deed, issued to the main estate manager. Management of existing Outback Land Areas will remain unaffected. Land Lot Deed holders will have the opportunity to take part in a Calypso Citizenship land grab. Certain areas will be opened on Calypso where deed holders can stake out their land plots. This system development is scheduled to begin in 2012. Land Lot Deed holders will be able to build house(s) on the plot(s) they have staked out. (Minimum of 9 plots in a 3x3 format suitable for a structure). This system development is scheduled to begin in 2013. Additionally, a comprehensive political system is planned that will allow Land Lot Deed holders to become directly involved with decisions affecting the future development of Calypso, with voting power relative to the number of Land Lot Deeds held. This system development is also scheduled to begin in 2012. This information has been released prior to the official press release planned for 16th November as a courtesy to Entropia Universe participants. Further information and specifications may be applied. Virtual items are fictional in-world graphical objects with a predefined set of parameters in Entropia Universe and will often have names similar or identical to corresponding physical categories such as "people", "real estate", "possessions”, “currency”, “cloths” and the names of specific items in those categories such as "house", "rifle", "tools", "armor", “coat”, “money” etc. (“Virtual Items”). Despite the similarity in terminology, all Virtual Items, including virtual currency, are part of the Entropia Universe System and/or features of the Entropia Universe, and MindArk and/or respective Mindark’s Planet Partner(s) retains all rights, title, and interest in all parts including, but not limited to Avatars, Skills and Virtual Items. These retained rights include, without limitation, patent, copyright, trademark, trade secret and other proprietary rights throughout the world. Notwithstanding any other language or context to the contrary, as used in this EULA and/or in the Entropia Universe in the context of Virtual Items, You expressly acknowledge that all terms like “exchange of”, “trade with”, “purchase of”, “sale of” or “use of” Virtual Items, and all similar terms in context of transactions with Virtual Items, refers to the licensed right to use a certain feature of the Entropia Universe or the Entropia Universe System in accordance with the terms and conditions of this EULA. As part of Your interactions with the Entropia Universe, You may also, “construct”, “craft”, “compile”, “design”, “modify” or in any other way “create” Virtual Items. Notwithstanding any other language or context to the contrary, as used in this EULA and/or in the Entropia Universe in the context of the in-world creation of Virtual Items, You expressly acknowledge that You do not obtain any ownership right or interest in the Virtual Item You “create” but all such terms refer to the licensed right to use a certain feature of the Entropia Universe System or the Entropia Universe in accordance with the terms and conditions of this EULA. For clarity, MindArk and/or the respective MindArk’s Planet Partner retains all rights, title and interest to all Virtual Items You create in-world. The Land Lot deeds are tradable just like any other item in Entropia. Revenue share dividends will be paid once per week, to whichever participant currently holds the deed at the time of disbursement. Each Land Lot deed provides an equal share of the total Planet Calypso Planet Partner Gross Revenue. The plots that will be made available later will not affect a deedholder's share of revenue. Once a planet partner has reached a certain criteria, such as level of users and a record of profitable revenue stream they will have the chance to include this system on the planet. Land Lot Deeds can be found on the Entropia Universe auction, under the ‘Global’ location (selectable in the top right-hand corner of the auction interface), and are sold by the avatar James Bowerbird EstateBroker. Land Lot deeds will be added to the Entropia Universe global auction at varying times throughout the day so that participants from all timezones will have an opportunity to acquire deeds during the initial offering. The Land Lot deeds are tradeable just like any other item in Entropia Universe. Revenue share dividends will be paid once per week, into the PED card balances of all participants currently holding Land Lot deeds at the time of disbursement. Land Lot deeds need not be held in an avatar’s carried inventory; as long as the deed(s) are included on the ‘My Items’ list, dividends will be received. The Planet Partner Revenue paid to Planet Calypso (AR Universe AB) will be divided equally: 50% paid to Land Lot deedholders and the remaining 50% to cover the ongoing development, marketing and operating costs of Planet Calypso. Land Lot deeds are unable to be looted in PVP areas. To clarify, does this mean that of the 100% fees collected, 50% goes to Mindark, 25% to the Deed Holders, and 25% for Mindark to cover ongoing development (Kim's development Team I'm guessing)? Also, what happens if any of the deeds get sold to the trade terminal? If I am not mistaken, the Land Lot deeds are unable to be sold to the TT. Will the deed item info screen be updated to show 59,999 as maximum amount of deeds instead of 60,000, and will the distribution of peds to deed holders be changed by this... Same question for any deeds held by an avatar that leaves the game by not logging in for the amount of time before account is made to expire, etc, if deed holder is permanantely banned, etc. Will TTed deed shares go back to Mindark or will those sort of deeds go back on to the auction or something? Since there is a set number of deeds, these seem to be fairly important questions. Each deed will always receive 1/60000th of the shared revenue, regardless of the status of other deeds. Will Voter Class Land Areas be subject to the same taxation system as other current land areas? Will Voter Class Land Areas require consistant upkeep costs? The Land Lots given to Land Lot deedholders are not the same as Outback Land Areas, and will not generate hunting or mining tax revenue for the holder, nor will they require any upkeep. Will the initial price for released Land Areas remain the same when released regardless of demand when released? All 60,000 Land Lot deeds will be offered on the auction for the same price: 1000 PED. Once acquired, participants are free to trade the deeds among themselves just like any other item. How often will batches of land areas be released? The interface and procedure for the land grab phase of the Land Lots is still being conceived, and as stated in the initial announcement, will begin development in 2012. Will there be any limitations to the number of Voter Class Land Areas that can be purchased? Per Batch? Overall? There is no limit to the number of Land Lot deeds any one participant may purchase. If the purchase of multiple Voter Class Land Areas is allowed, does ownership of multiple properties provide stronger voting power? While all of the details of the political system have not yet been finalized, it is very likely that each Land Lot deed will be equal to one vote, for a total of 60,000 potential votes on any given issue. Will there be any distinguishable penalty imposed on..."non-citizens?" Are there plans to allow for citizenship through other, non-money, related means in the future? This is something that may be considered in the future, once the design of political system reaches a more advanced stage. What protections will non-citizen players have in the face of the power of those with citizenship? What makes you feel that protections will be needed? Land Lot holders (citizens) will have no special power over regular colonists. Are there plans to release citizenship measures on partner planets like ROCKtropia or Arkadia? How much land from specific areas and from where will these land areas be created? On what sorts of issues will citizens be able to vote? Economic? Design? Expansion? Will there an organized body to represent citizens? The political and Land Lot estate systems are still in early stages of planning, so I am unable to provide any details at this time. One of the main reasons for introducing this new system was to finance a substantial marketing campaign for the Entropia Universe. We are committed to initiating a marketing campaign as soon as possibly at much larger scale then we have ever done before. It seems that some participants still hold the misconception that buying a Land Lot deed is like buying a "mini Land Area" or that Land Lot deeds will function in a way similar to other existing estates. This is not the case, as we have tried to make clear in our original announcement and in later statements. Land Lot deeds are not the same as Outback Land Areas (commonly referred to as LAs or Land Areas). Land Lot deedholders will not have the ability to set tax rates, manage mob DNA setttings, host events, etc. The Land Grab mentioned in the initial announcement simply describes a forthcoming system whereby Land Lot deedholders will have the ability to claim a 10m x 10m plot of land for each deed held. Will riots and protests be included in the politics system? Details of the political system are still being considered, so I cannot comment on what types of activities will be included. However, bear in mind that all of the terms of the Entropia Universe EULA and TOU will still apply, which would probably cover any type of disruptive riots and protests. There will only be PvP if you choose to enter the PvP enabled areas. It is your own choice whether you want to build your house in pvp or non pvp areas. MindArk, developer and publisher of the largest real money MMO, announced today that it will introduce a groundbreaking Citizenship System to Planet Calypso. The new system will provide revenue sharing to participants, and add a political system that will allow players to vote on major decisions affecting their virtual world, all for as little as $100 USD. "Our new Citizenship System will have a strong impact on the social and Virtual Worlds industry", said Jan Welter Timkrans, Chairman of MindArk. "People have always had the opportunity to make money playing our game and engaging in the micro transactions economy. Now they can actually share in the revenues of their favorite planet with a Land Lot deed and help decide its future via the political system." The new system grants users Planet Calypso citizenship and political voting rights. Citizens will also receive a share in the Planet Partner gross revenue of Calypso, paid weekly. Based on Planet Calypso's performance over the last 12 months, the potential return of investment (ROI) is expected to be between 27% and 30% per year. Each planet in the Entropia Universe is a separate Planet Partner, and the revenue share paid to deed holders will come from the Planet Calypso revenue stream. Sixty thousand land lot deeds offered at $100 USD each are available exclusively through the Entropia Universe global auction and can be acquired by anyone after creating a free avatar. The new Citizenship System will showcase the economics of a successful Planet Partner on the Entropia Universe platform, and allow users to participate in that success. Planet Calypso is the oldest of the planets in Entropia Universe, with over one million registered accounts and over $400 million USD per year in user-to-user transactions. Until now, possessing land in Entropia Universe has been very exclusive, with the market price for land deeds ranging from $5,000 to upwards of $500,000 USD. In the new Citizenship System, just about anyone can share a piece of an entire virtual world. For more information on MindArk or the Citizenship System please visit http://www.entropiauniverse.com. MindArk is the developer of the virtual 3D environment Entropia Universe. It is the leading platform for micro transaction driven 3D virtual worlds and MMO games. The Swedish company MindArk, develops, operates and markets Entropia Universe and the Entropia Platform. Entropia Universe is a 3D internet virtual environment with a unique, integrated economic system and stunning graphics. The Entropia Platform is a secure entertainment and business platform, enabling companies and organizations all over the world to build content on differently themed planets all connected inside Entropia Universe. The statements contained in this release that are not historical facts are forward-looking statements. The Company cautions readers of this press release that a number of important factors could cause MindArk's actual future results to differ materially from those expressed in any such forward-looking statements. MindArk and the MindArk logo are registered trademarks of MindArk. All other company names mentioned herein may be trademarks of their respective owners. Copyright © 2011 MindArk. All Rights Reserved. Q. How many Land Lot deeds will be offered? Q. What is the price of each Land Lot deed? A. Land Lot deeds are available for 1000 PED each (equivalent to 100 USD). Q. Where can Land Lot deeds be acquired? A. Land Lot Deeds are acquired from the Official avatar James Bowerbird EstateBroker on the Entropia Universe auction, under the Global Auction (selectable from the drop down menu in the top right corner of the auction interface). Q. What quantities of Land Lot deeds are available? Q. I can not see any single deeds available on the Auction? A. Land Lot deeds will be added to the Entropia Universe global auction at varying times throughout the day for the convenience of participants from different timezones. Q. Is there a limit on the number of Land Lot deeds each participant can acquire? A. Participants may acquire as many Land Lot deeds as they wish. Q. How will the proceeds of the Land Lot deeds be used by MindArk? A. The proceeds from the Land Lot deeds will help to finance a substantial Entropia Universe marketing campaign, along with further development of Entropia Universe and Planet Calypso. Q. How is the revenue share for Land Lot deeds calculated? A. The Planet Partner Gross Revenue will be divided as follows: 50% paid to Land Lot deedholders (1/60000), and the remaining 50% retained by Planet Calypso (AR Universe AB) to cover the ongoing development, marketing and operating costs of Planet Calypso. Q. How is the Planet Partner Gross Revenue calculated? A. Planet Partner Gross Revenue is calculated and paid by MindArk to the Planet Partner, and includes avatar activity on Planet Calypso, along with the activity of Calypso avatars in Space and on other Entropia Universe planets. Avatar activity includes deterioration of items, as well as various other fees and avatar activities. Q. How will Land Lot deedholders receive revenue share payments? A. Payments will be deposited directly onto each deedholder’s Entropia Universe PED Card balance. Q. What is the expected yearly return on investment (ROI) of a Land Lot deed? A. Based on Planet Calypso’s performance over the last 12 months, expected ROI is between 27% and 30% per year. The actual revenue share paid to deedholders may be higher or lower than this, depending on the amount of activity on Planet Calypso in the future. Q. When will Land Lot deedholders begin receiving revenue share payments? A. Revenue share payments are planned to begin distribution on Dec. 5, 2011. Q. How often will revenue share payments be made? A. Revenue share payments will be made weekly, calculated based on the Planet Partner Gross Revenue generated by Planet Calypso during the preceding week. Q. Will there be regular statements of revenue share earnings? A. Yes. Every six months, audited figures will be presented on MindArk’s website (www.MindArk.com) so that deedholders can verify their revenue share payouts. In addition, a dedicated web page will be made available where deedholders can check their weekly payments, and will include an ROI calculator. Q. Once acquired, can Land Lot deeds be traded? A. Indeed, deeds can be traded among participants at a participant-determined market price, just like every other item in Entropia Universe. Q. If I trade one of my Land Lot deeds, who will receive the revenue share payment for the current period? A. Revenue share payments are always distributed to the Entropia Universe avatar account currently holding each deed at the time of disbursement. Q. Do I need to keep the Land Lot deed in my avatar’s inventory in order to receive revenue share payments? A. No. Deeds can be kept in personal storage, estates, containers, etc., and still receive payments. As long as the Land Lot deed(s) appear on the ‘My Items’ page in the Account section of the www.EntropiaUniverse.com website, your avatar will receive revenue share payments. Q. Can Land Lot deeds be looted from other participants in PVP areas? A. No, Land Lot deeds are not lootable in PVP areas. Q. When is the Citizenship and Politics system expected to be released? A. The Citizenship and Politics system is scheduled to begin development in 2012. Q. How many votes in the forthcoming Political System will Land Lot deedholders receive? A. Each individual Land Lot deed entitles the holder to one vote. Thus, each political issue will have a maximum of 60,000 potential votes. Q. How exactly will the political system work? What kinds of issues will Citizens take part in shaping? A. The full details of the Citizenship and Politics system are still being finalized. More information will be provided as the design and development stages of this exciting new Entropia Universe system progress. Q. Are Land Lots the same as Land Areas? A. No. Outback Land Areas (commonly referred to as Land Areas) are part of a different system within Entropia Universe, through which participants can purchase a defined area of land and impose taxes on the hunting and mining activities of other participants. By contrast, Land Lot deeds offer participants the opportunity to receive a share of the entire activity on Planet Calypso, not just activity made in a particular area. Q. When will existing Outback Land Area owners receive the complimentary Land Lot deed mentioned in the original announcement? A. The complimentary deeds for Outback Land Area owners will be distributed shortly before revenue share payments begin on Dec. 5, 2011. Q. The original announcement mentions a ‘Calypso Citizenship Land Grab’. How will this system work? A. Various regions of Planet Calypso will be designated where Land Lot deedholders will have the opportunity to stake a claim on a 10x10 meter plot of land for each deed held. Q. How will building houses or other structures on Land Lots function? A. In order to to build a structure on claimed land, participants will need to hold a minimum of nine (9) Land Lot Deeds, and claim plots in a 3x3 (or larger) format, suitable for the construction of a structure. Q. Will I be forced to engage in PVP combat in order to claim my Land Lot plots? A. No. The regions designated for Land Lot claims will be offered in both PVP and non- PVP areas. Q. What happens to my revenue share payments if I do not claim any Land Lot plots? A. You will still receive all revenue share payments. Land Lot plots are simply an additional feature offered to those who choose to support the future growth of Planet Calypso. GOTHENBURG, Sweden, April 4, 2012 /PRNewswire/ -- MindArk, developer and publisher of the largest real money MMO, announced today that an investor acquired $2.5 Million Dollars (25 Million Project Entropia Dollars, PED) worth of land lot deeds on Planet Calypso. The land deeds, bought through the Citizenship system, allow revenue sharing to participants. Since the release of the Citizenship system in November almost all of the initial offerings of 60 thousand deeds have been acquired by participants with an annual ROI of approximately 27%. When a player procures land deeds they are granted certain privileges, these include receiving a share in the Planet Partner gross revenue of Calypso, paid weekly. This means that those in the Citizenship system are directly profit sharing from the game itself. The land deeds are auctioned at a base price of $100 per deed and have mostly gone out one-by-one. However large monetary transactions are nothing new in Planet Calypso with one player paying $330,000 for a Virtual Space Station in 2010 which, at the time, set a world record. The Citizenship System allows users to participate directly in the Entropia Universe's future. Planet Calypso is the oldest of the planets in the Entropia Universe, with over one million registered accounts and over $400 million USD per year in user-to-user transactions. Under the newly implemented Citizenship System, just about anyone can share a piece of an entire virtual world, as investment is open to anyone who creates an avatar and has the desire. For more information on MindArk or the Citizenship System please visit www.entropiauniverse.com. Copyright © 2012 MindArk. All Rights Reserved. MindArk announced today that to celebrate the one-year anniversary of the Calypso Land Deed event, MindArk will offer 5,000 deeds at US$115 each. The land deeds provide revenue sharing to participants so players can receive a share in the Planet Partner gross revenue of Calypso and the first deeds will be made available from the in-game auction on Thursday, November 1, 2012. One year ago sixty thousand Calypso land deeds were offered at US$100 each and were available through the in-game auction system. MindArk has now negotiated a buyback of 5,000 deeds out of the 25,000 acquired by one single investor. By performing a buyback of these deeds from one investor, the company will be able to redistribute the deeds more evenly and allow more players to join in. "We are happy to have negotiated this excellent offer for our participants. As most of the 5000 deeds will be placed on the auction individually we hope many more users will take the chance to be part of this ground breaking program," said David Simmonds, CEO of MindArk. This page has been accessed 171,792 times.